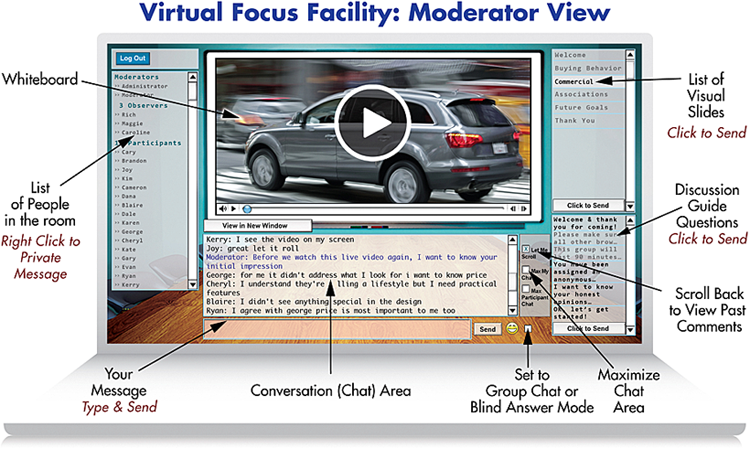 Online focus groups in real-time via text chat offer a multitude of advantages to participants, the moderator, and back-room observers. Beyond simply offering a way to effectively interact with more than a dozen research respondents at once, InsideHeads also has the necessary tools and experience to maximize the value of participant feedback. Why just meet for a chat when InsideHeads can also seamlessly elicit individual feedback before or after the group discussion, either through an in-depth phone interview, a questionnaire, or some other enlightening participant activity that will benefit your study. Chat focus groups are a fixed duration of usually no more than 2 hours and the discussion occurs in real-time. Participants respond simultaneously to each question the moderator poses and their comments appear chronologically in a frame that scrolls automatically. In this situation, the participants respond with text to the moderator’s questions, which while typically also typed, can also be presented to the group as live or recorded audio or video. Regardless which primary mode of interaction the moderator chooses, participants can receive and react to visual stimuli in any format. Chat groups are great for gauging reactions to new concepts, evaluating websites, testing ads and copy, and brainstorming for new ideas. Chat online focus groups are also the lowest cost of all online qualitative research methods. The low cost-per-interview (CPI) of chat focus groups is the result of having both multiple and multi-synchronous responses in a single session. See what it’s like to observe a live chat online focus group. I would like additional information on how you conduct your focus groups. Hi Orla, InsideHeads has been conducting online focus groups for a long time! I’ll ask Jennifer to contact you directly, she can answer any questions you have.